I'm really looking forward to this event! Be sure to join! Are these events seasonal, or will they have them every month? Every month. The Vintage event has been so successful, they are looking at extending these larger events to Legacy and Pauper in 2016. Exactly. In same article Lee Sharpe also announced ending of daily events at some point and replacing it with appropriate format league. The big problem with their prize structure is that you have to top4 to get something valuable though. I'm so happy to see WotC support vintage on mtgo at least. If they get rid of daily events I would probably stop playing altogether. Why? League prizes are a joke. It's a waste of time and money. These power nine tournaments seem really cool, but I missed the first two and I'm going to miss the next one too. I can't ever seem to get enough free time to play more than four rounds of magic. I'm glad that they're working out for so many people and I would love to participate, but it just isn't in the cards. Excited that I (should) be able to play in this this month! For real? Just building up my pool, and got to say I am very pleased with the Software. Now with a good tournament structure, is like wow! final reminder that this thing is today. I'm planning to play in it. Should be fun. I am also going to play it. Let's see if we can break the 103 player record! Pretty good for the day after Christmas. So I woke up at 5:45am and joined in for my very 1st online tourney ever (because they are always crap time for Australia)! Played 4c Mentor today to a 4-3 finish. Breakers put me at 33rd so I just missed getting my entry back. Was a lot of fun, had some high highs and some nailbiters. At one point I looked at 12 cards for 5 outs in my deck and found none of them. But then a round or two later I won on t3 both games, so it balances out. Can't wait to see how many people get in next month! 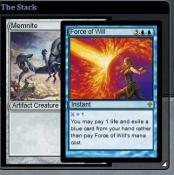 Maindeck White Leyline is awesome tech! Happy these tournaments are getting so popular! Getting me closer to the idea I should put some money away to save up and buy into Vintage. Neat deck. I'm just wondering if Supreme Verdict isn't superior to Terminus in this deck, since I feel like uncounterability and pitching to FoW in irrelevant MUs outweighs the chances to miracle it every now and then (1 Top, BS, Recall). Am I missing anything here? I often run Mystical & VT along with Miracles but I cut it today as I don't run any Misstep and I also feel that the top deck tutors & Miracles work better when paired along with instant speed draws (Gush, Remora...). Terminus only triggered once today against Dredge. I suppose I favoured it over Verdict because I found that aggro are just getting way too fast. Any word on what won? Or top 8ed? The final was won by Oath over my friend lampalot(Michael) with close to the same list as mine. he had wurmcoils and dismember in sb. I played RUG Delver because I expected a bunch of Shops and TPS. I went 1-2 drop because I had some other things I wanted to do. Round 1 I beat Shops easily, round 2 I lost to Probasco who got off turn 1 EtW for 18+ Goblins two games in a row. Match 3 was vs Oath who went Mox, orchard, oath turn 1, two times in a row with protection. It was disgusting. Tom Bombadil is a merry fellow; Bright blue his jacket is, and his boots are yellow. Heh 1 storm deck in the top 16. 3 Monastery Mentor cards in the whole T16 and it is 16th place! I decided to go with MD Unmask, and I was short on 2 more Serenity in SB. After 2-0 start, Belcher wrecked me game 3. I lost another one to Pyromencer after series of mulligans and some questionable side boarding. My baby was waking up all the time since it is flue season here and I was distracted, so I finished with 3-4 and failed to be in T32 as on previous two challenges. I really enjoyed game vs tribet as his deck is not something usually found on mtgo. Got wrecked in mirror vs Randy Buehler playing his VSL list. Looking forward to next Power9 challenge.